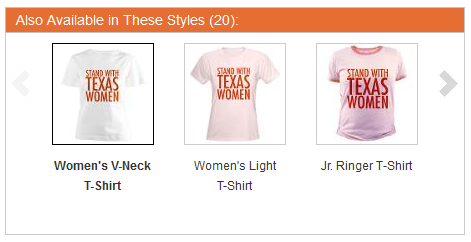 Here is a round-up of the Stand with Texas Women / Stand with Wendy products that I have been able to find. I'm sharing these because I didn't have an easy time finding them, so maybe this will help others. • If you donate $25 to the Travis County Democratic Party, they will send a T-shirt "while supply lasts". It's unknown what range of sizes they have. • Uterus with Words, Uterus with Longhorn, and Stand With Wendy sneakers at 4000 Years For Choice. Sizes S-3XL, various colors including Orange. • I Stand With Wendy free bumper sticker from Naral Pro-Choice. Bumper Sticker Magnet from Amazon in case you don't like permanently sticking things to your car. UPDATE: Please note that the CafePress linking system is deeply unreliable. The same link will take you to different pages at different times Because Jasper, I guess. I tried to attach affiliate codes to the links, thinking that might "anchor" the link better, but no. • Stand With Wendy from CafePress store "Vegetas-Princess". Available in 76 styles (which I will not individually list). • Come and Take It Uterus with longhorns from CafePress store "Come and Take It". Available in multiple styles. Please feel free to list links in the comments. This seeks to be a comprehensive round-up.